Status: Uncommon regular spring and fall migrant east, rare casual elsewhere. Documentation: Specimen: UNSM ZM7609, 25 Oct 1890 Lincoln, Lancaster Co. Although migrants presumably pass through Nebraska on a regular basis, there were only 17 reports prior to 2013. 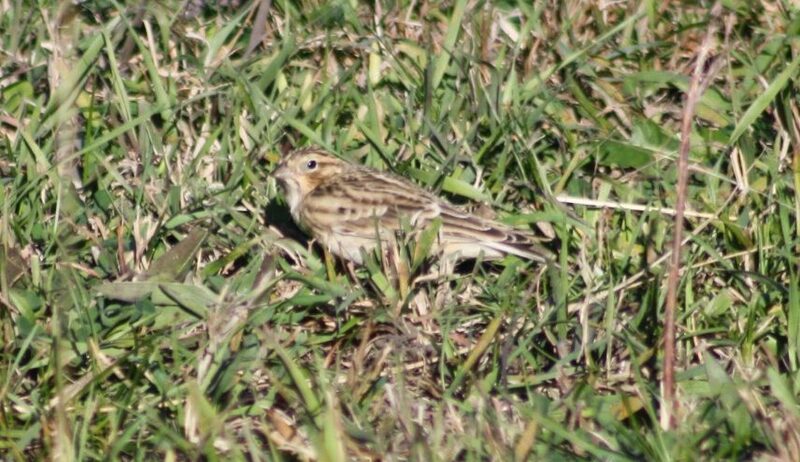 Since 2013, however, Smith’s Longspurs have been found with some regularity at native prairie remnants at Pawnee Prairie WMA, Pawnee Co and Spring Creek Prairie, Lancaster Co. There are no spring reports away from the east. Although regular wintering occurs north on the Great Plains only to extreme south-central Kansas, there are rare reports during winter in the Flint Hills (Thompson et al 2011), and there are several dates earlier than those listed above that suggest earlier arrival in recent years and possibly a northward shift in the wintering range. Six of these nine reports are since 2008: 1 Feb 2012 adult male Custer Co, 5 Feb 1959 Nemaha Co, 12 Feb 1988 four at Pawnee Lake, Lancaster Co (Mollhoff 1989), 21 Feb-6 Mar 2016 up to nine at Spring Creek Prairie, 2 Mar 2008 Thurston Co, 1-3 on 4-9 Mar 2017 at Spring Creek Prairie, six on 13 Mar 2016 at Berg Prairie, Nemaha Co, 21 Mar 1963 Webster Co, and 21 Mar 2016 Antelope Co.
High Counts: 125 at Pawnee Prairie WMA 6 Apr 2013, 35-50 at Berg Prairie 3 Apr 2013, 25 at Burchard WMA, Pawnee Co 9 Apr 2011, and 24 at Spring Creek Prairie 6 Mar 2016. There are earlier dates, both from the west, 18 Sep 1975 Scotts Bluff Co and 27 Sep 1981 Sheridan Co (Rosche 1982, Williams 1982) and later dates 14 Dec 2001 Scotts Bluff Co, three on the Lincoln CBC 17 Dec 1978, one on the Omaha CBC 18 Dec 1999 (“Excellent details”, CBC Regional Editor), and two on the Lincoln CBC 20 Dec 1992. Briskie (2009) indicated that fall migration is limited to eastern Nebraska as in spring; however, reports suggest that Smith’s Longspur in fall occurs further west than in spring. There are five reports from the west: 18 Sep 1975 Scotts Bluff Co, 27 Sep 1981 Sheridan Co (Rosche 1982, Williams 1982), 20 on 15 Oct 2006 near Chadron, Dawes Co, 12 Nov 1966 Custer Co, and 14 Dec 2001 Scotts Bluff Co. There are four fall records from eastern Wyoming 26 Sep-7 Oct (Faulkner 2010). Photograph (top) of a Smith’s Longspur at Spring Creek Prairie, Lancaster Co 11 Oct 2014 by Sam Manning. Briskie, J.V. 2009. Smith’s Longspur (Calcarius pictus), version 2.0. In The Birds of North America (A. F. Poole, Editor). Cornell Lab of Ornithology, Ithaca, New York, USA. https://doi.org/10.2173/bna.34. Cortelyou, R.G. 1974. 1974 (Forty-ninth) Spring Migration and Occurrence Report. NBR 42: 66-86. Williams, F. 1982. Southern Great Plains Region. American Birds 36: 192-194.